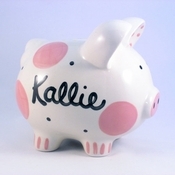 These adorable ceramic Piggy Banks by "Little Worm" are hand-painted and personalized with your child's name. They also make perfect baby gifts! Note: Unfortunately, we cannot accept returns on Custom Items, as they are custom made to your specifications.